Presentation Re-cap at the 9th Annual SESPRS Atlanta Oculoplastic Symposium - Patrick Sullivan, M.D. You would have enjoyed the 9th Annual SESPRS Atlanta Oculoplastic Symposium in Atlanta, Georgia. Surgeons from all over the world attended this international well-known symposium. I was honored to be among the invited faculty. 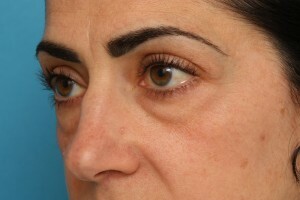 Surgeons presented their solutions to both common and unusual problems involving the eyelids and upper face. Some were using synthetic injectable agents while others were championing synthetic implants that were screwed into position. I participated on 2 panels: the first was on Lower Blepharoplasty moderated by Dr. Jelks and the afternoon panel topic involved – surgical browlift and forehead rejuvenation moderated by Dr. Hirmand. A frequent complaint by patients coming to our office: “People tell me I look tired when I am not.” They also complain and are bothered about the “bags” or puffiness as well as the circles under their eyes. We were particularly excited to share our techniques with the attendees as we feel we have been able to solve the problem of “tired eyes” in many patients. We perform this procedure with hidden incisions so no scars are visible. This has been very exciting for our patients and for us. 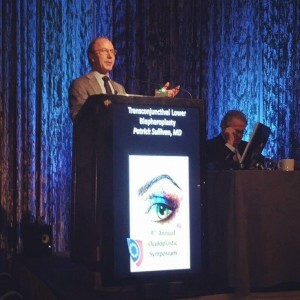 We presented our new classification of the different types of eyelid deformities and how we use specific treatments to address each person’s unique problem anatomy. Much of the time these problems are inherited. We showed numerous examples of each anatomical type so surgeons could see what they can do to help. We are now frequently using the individual’s own fat with their associated stem cells to fill and smooth out the circles around the eyes. This technique has proven to be effective. Although this procedures is time consuming and technically demanding our experience of having done hundreds of this type of treatment for our patients has allowed us to have results that have proven both effective and reliable. It has been so gratifying to have high patient satisfaction. Another common complaint we hear often: “My upper eyelids look droopy and you can’t see my eyes as well because of all this hanging skin.” We often find the eyelid skin has become lax and excessive with the passage of time; frequently the whole forehead will become saggy. This often leads to a hooded appearance around the eyes that extends out into the temple region. My presentation focused on how we artistically studied where the eyebrows are supposed to be. 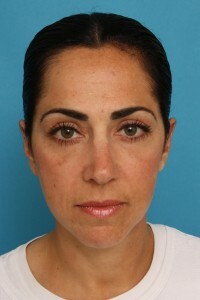 The brows should NEVER be too high. Our goal is to create a very natural appearance. Ultimately, the real key is to be able to accomplish that goal in the operating room. Thus, we went to the anatomy lab and performed studies to determine how to independently shape each segment of each eyebrow to bring about the most artistically natural enhancement on both men and women. It has been so exciting to be able to do this for our patients in the operating room and to be able to share the information with fellow plastic surgeons that attended this symposium. We have performed over 700 of these procedures and have developed ways to make the treatment remarkably safe and reliable. 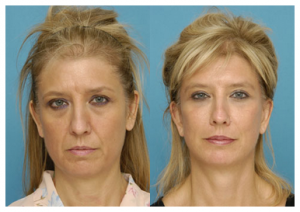 In addition, this procedure is performed with intravenous sedation and with NO GENERAL anesthesia needed. This is a very exciting treatment to perform and many of our patients have called these treatments “transformative.” It is so gratifying to share this with our patients and also with other surgeons who want to learn about the latest ways to rejuvenate eyelids and faces.